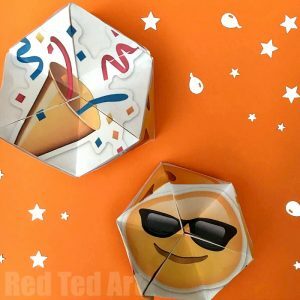 With the growth of our YouTube channel, we have finally EMBRACED the world of paper crafts and with that DIY Paper Toys – YouTube is such a great visual medium to share instructions to simple paper crafts, that look “really hard” or “really complicated” when photographed step by step, but are in fact easy AND fun to make when watching a video. 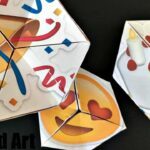 To celebrate our love for paper and paper toys, I finally have a list of 12 DIY Paper Toys to share with you. 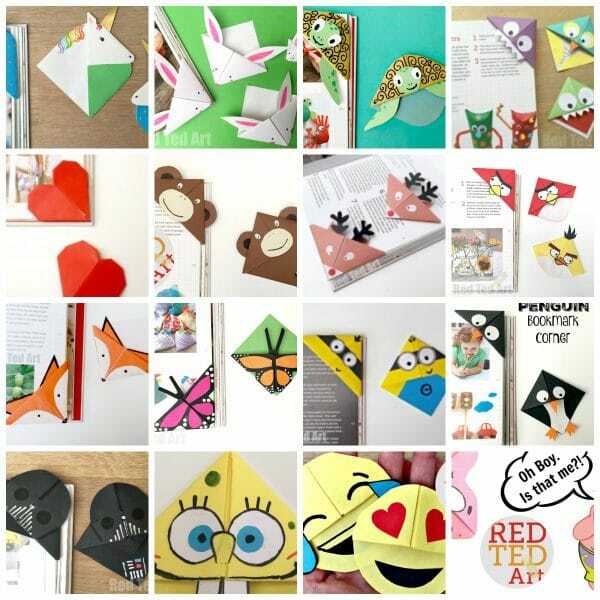 However THIS LIST will continue to grow over time.. and I will update this post for you regularly with our lastest paper crafts!!! 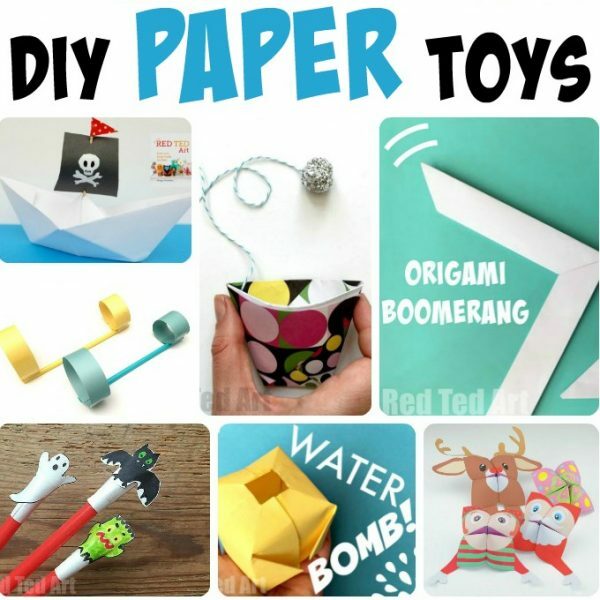 The majority of these Paper Toys literally only need paper. Some need a little tape, a snip here or there or some pens to decorate. But they are all fabulous and great fun and a number double up as great STEM or STEAM science activities too! 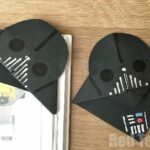 NOTE this paper toys DIY post was first published in June 16, but has been updated and republished for your convenience! 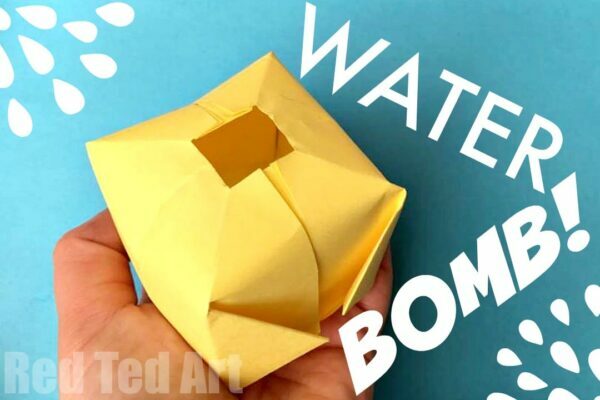 These DIY Water Bombs made from paper , newspapers or magazines, must be the BEST Paper Toys for summer fun. Quick to learn how to make.. and lots of refreshing fun on long summer days. 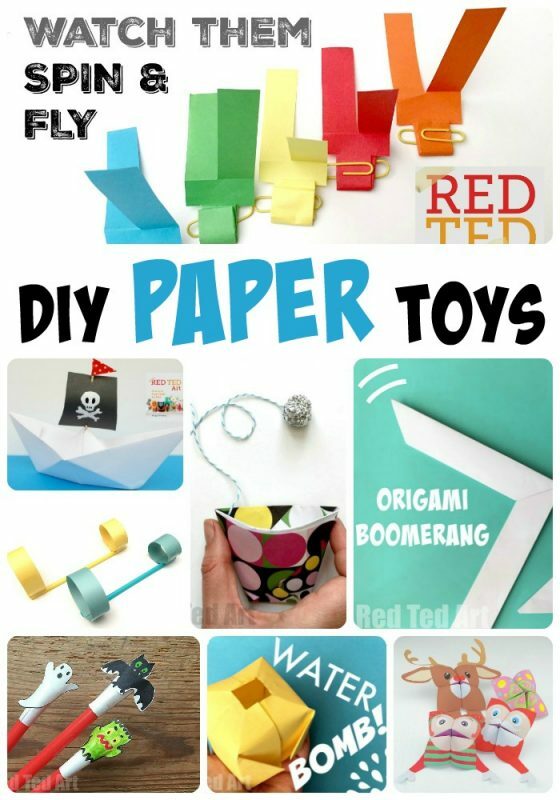 We love these paper gliders, as they are quick to make and great fun to play with. 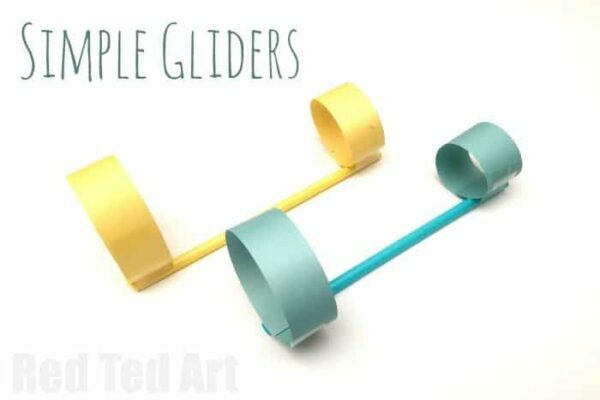 Also, there are some simple instructions as to how to turn these paper gliders into a great STEM science projects. LOVE. 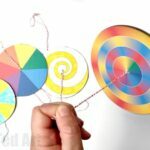 We also love these Paper Spinner DIYs…. they are so fun. 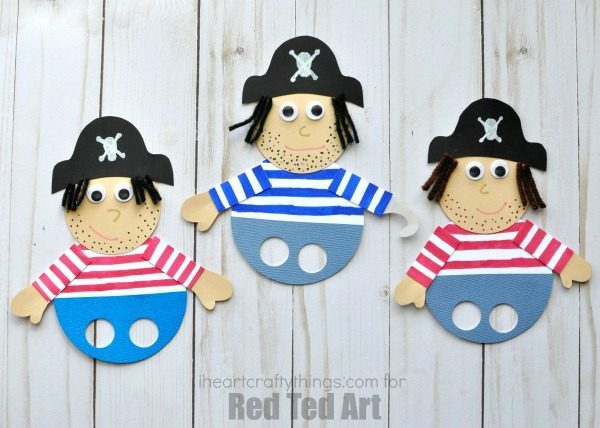 You can either use the handy free printables or get the kids designing their own. 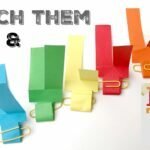 A great addition to any Color Theory Lesson plans too. STEAM at it’s best! 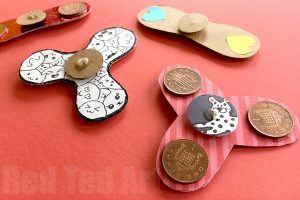 Another great alternative that doesn’t need coins (and therefore less glue..) are these fabulous NINJA Fidget Spinner DIYs. So cool!!! 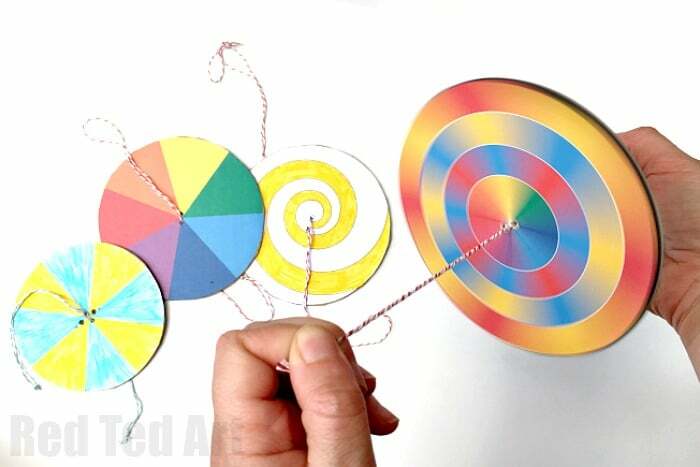 A great Fidget Spinner made from Paper for sure! 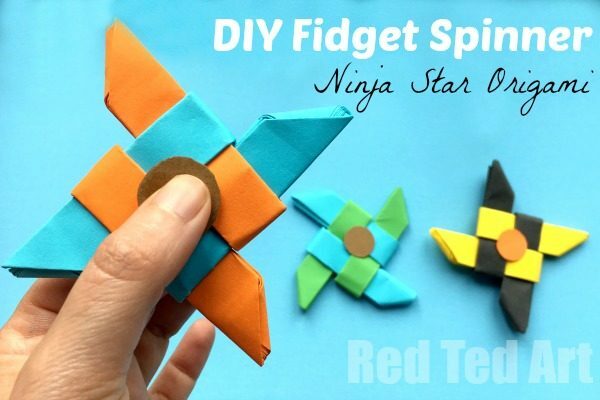 Or just make the Origami Ninja Star!! It is so fun and easy. 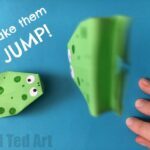 These paper helicopters are probably one of the easiest and quickest paper toys for you to make. 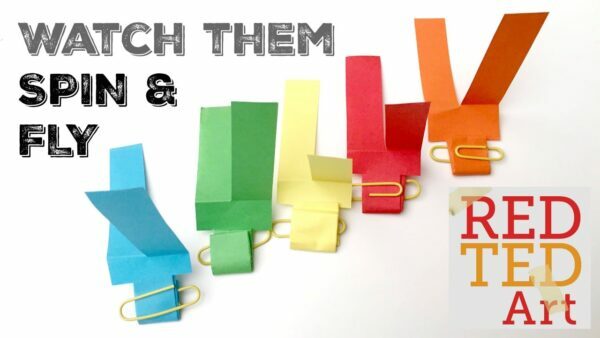 Again, there are some great additional hints to turn this simple paper craft into a fantastic little STEM activity, getting this thinking and exploring! 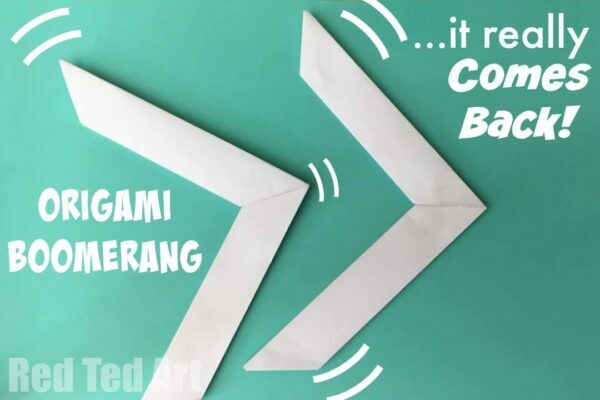 Probably one of our favourite origami crafts is this Origami Boomerang that REALLY comes back. Yes, it TOTALLY works. So so soo cool. Though you need to be “neat” the instructions are not actually that hard and you can decorate them into wonderful aboriginal inspired boomerangs. 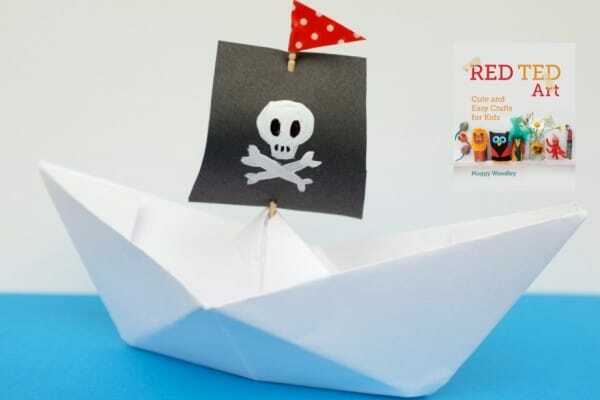 We love these paper boats. Simply because I have been making them SINCE FOREVER. This is one of MY classic childhood crafts and something that I made any time any place… from old bus tickets to a page torn out of my notebook. 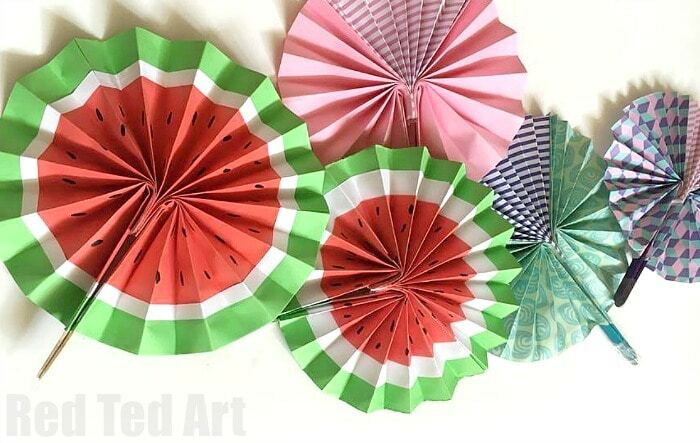 Fun with DIY Paper Fans – make these in any patters or designs (we ADORE the melon ones!!!). They fold away wonderfully to fit in your pocket or bag and whip them out when you need a little cool down!! 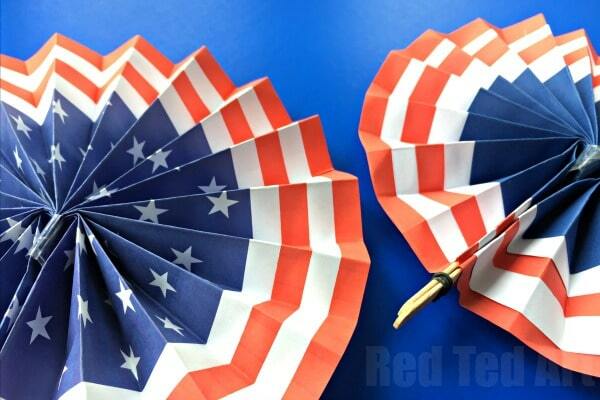 Check out 4th of July Paper Fan version too.. which you can either make from scratch or make use of the handy DIY Paper Fans Templates! 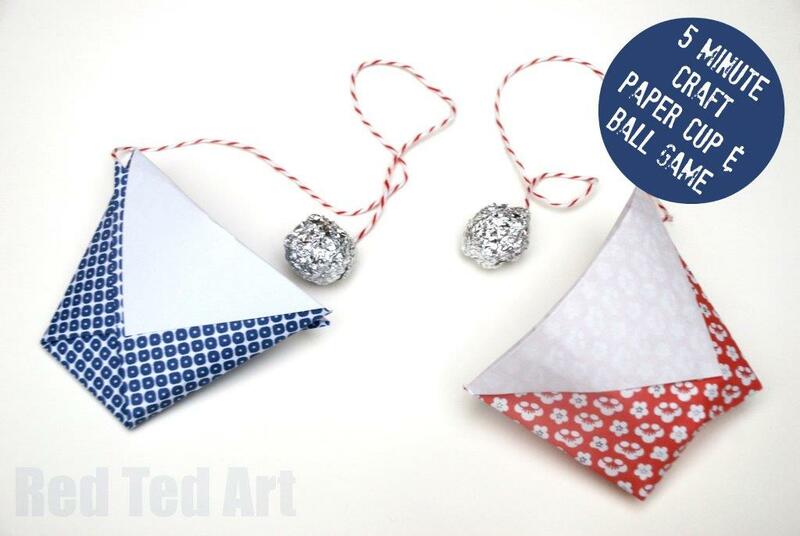 … a simple and cheap paper cup and ball game! 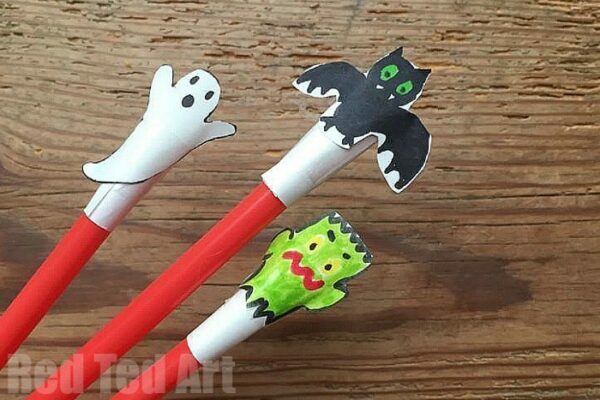 Straw and Paper Shooter Toys are super quick and easy to make and lots of fun. This is a Halloween Shooter Toy, but we have made a Bee and Butterfly Shooter Toy before.. and frankly, ANY design goes. Your imagination is the limit! 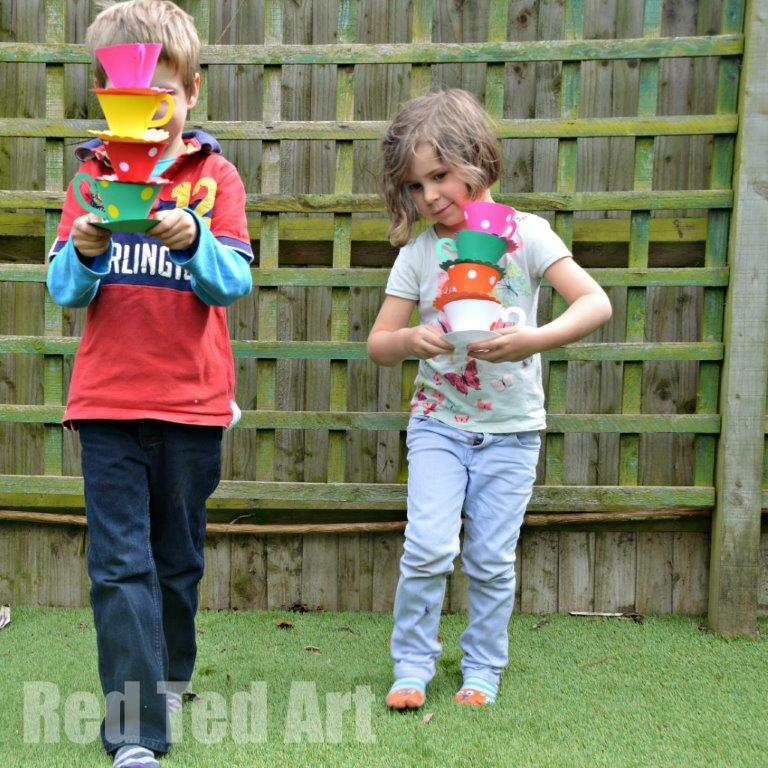 Not origami, but still paper – have a go at making some of these Alice in Wonderful Paper Cups. They make GREAT decorations at an Alice theme party.. BUT are also great for Teacup inspired party games (like stack the teacups and walk the walk..). Includes a free printable! Yes, this is easy…. 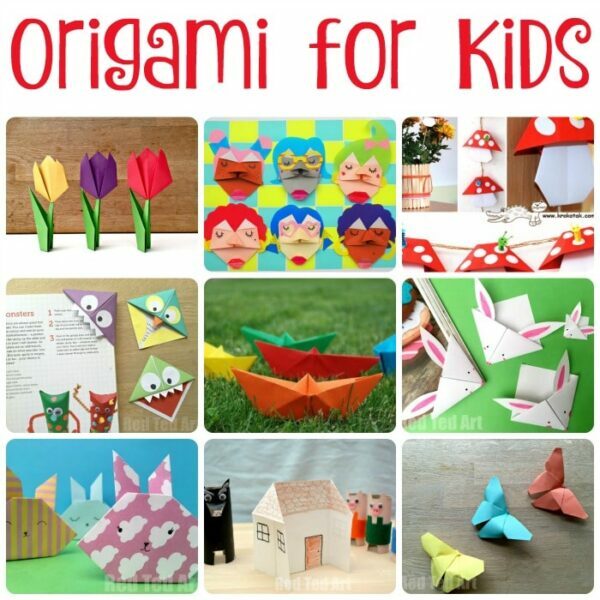 but again, oh so cute and another favourite of mine from my own childhood- easy Origami paper house. 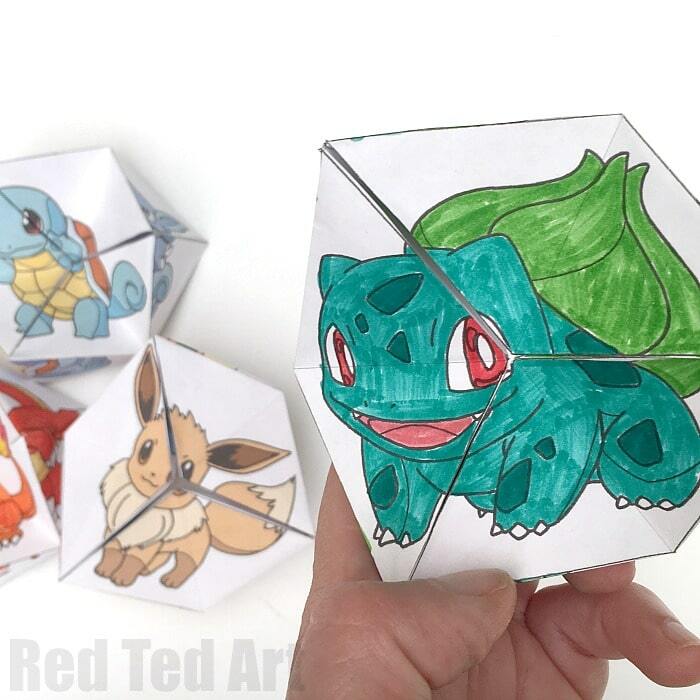 A quick and easy fold, simple to decorate and fun to play with. 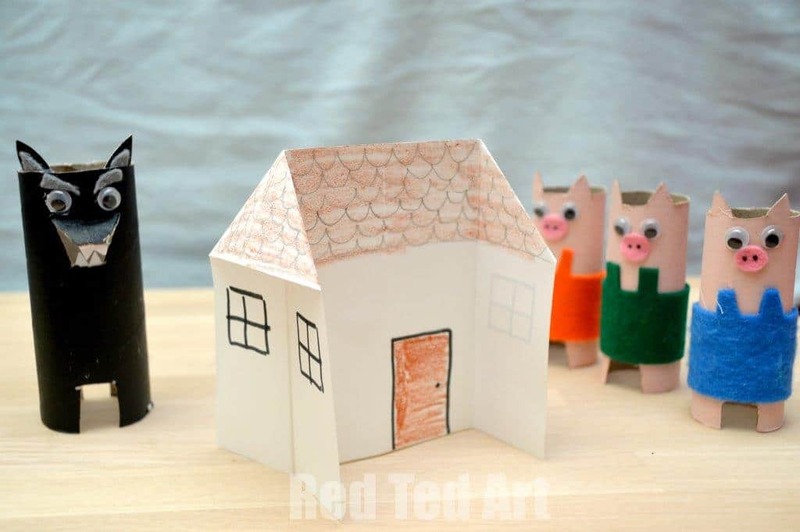 Combine with existing toys such as playmobile, or make your own TP Roll characters, such as our 3 Little Pigs craft. 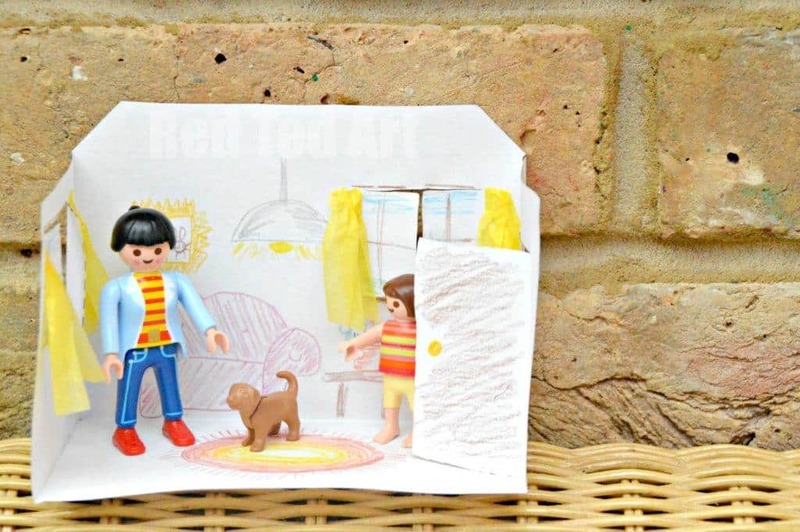 Another version of the paper house – this is a free printable. Make the room.. make another – stack and glue together to make a whole house! You have all seen the flextangles take the internet by storm. Here is a great “winter themed” version. Print colour. Stick and make it turn forever! 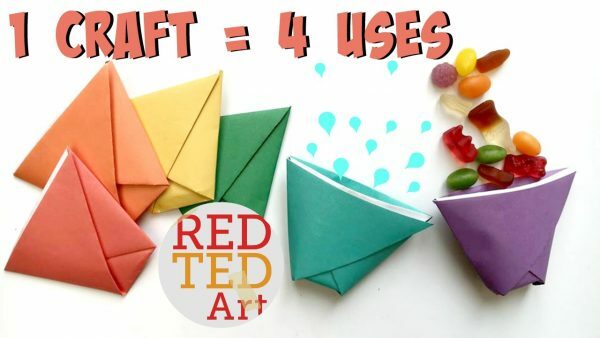 We LOVE a fortune teller (aka chatter box or cootie catcher). 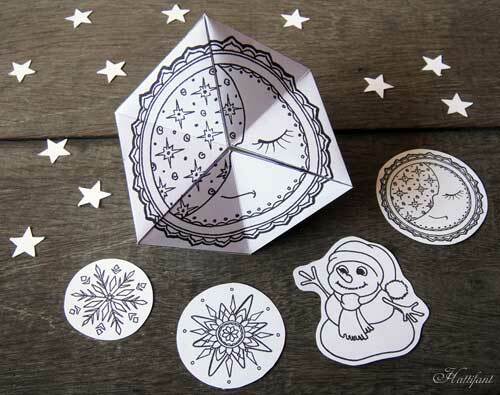 And you can either make them plain (and write your own instructions inside) or print out this fun set of Christmas Fortune Tellers. Aren’t they fun? 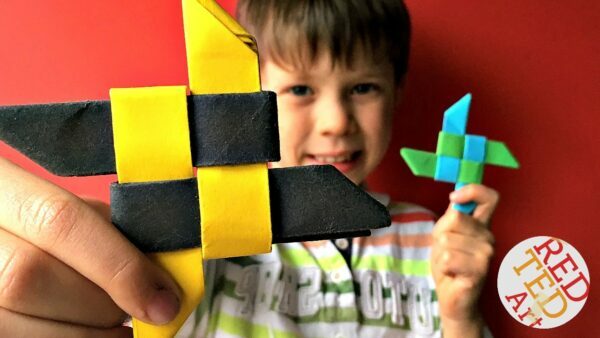 My kids have been making 100s (ok 10s, but quite a lot of chatter boxes these past few days). 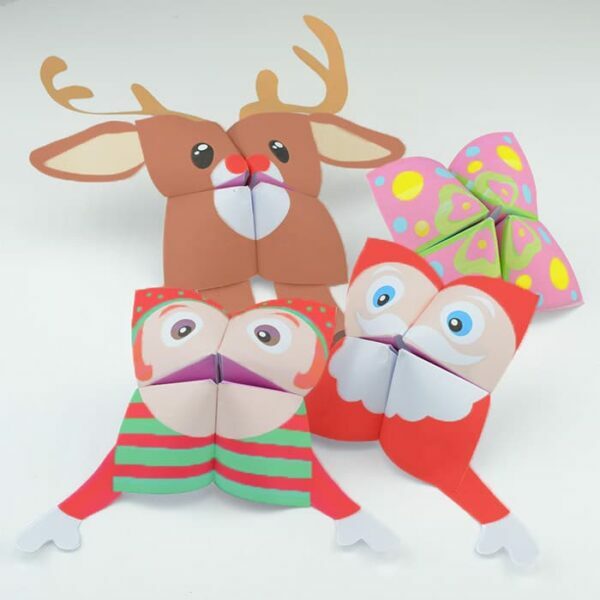 Remember do pop back to this Paper Toy post occasionally, as we have lots more Paper Toy ideas planned and will be updating this post over time. There is nothing more fun, than the humble piece of paper!! 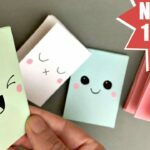 As well as these awesome Corner Bookmark designs. The kids will go potty over them! 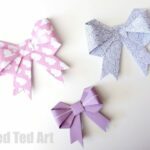 Origami Paper Bows – GORGEOUS GIFT WRAP IDEA! 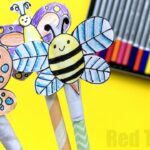 Great craft ideas.Thank you for a nice tip and great tutorial. Does anyone know how to make a seamless & tearless paper mouth/ snapper? All of the DIYs I’ve seen has a seam/fold running up the outside center & they tear & fold lips. The one that I am looking for is smooth on the outside, & you use your thumb & finger to close it. Relax your hand & it springs open. Also, it doesn’t have any projections, like the mountain in the boat. It is shaped like a snapper mouth, & is made with one 8″x 11″ paper, made into a square, however. I have been searching for instructions for over 40 years! If anyone knows what I’m talking about please tell me! Mmmh I am not sure I know one!! Sorry!